We supply and export a wide range of Flamed Granites,which are ideal for exterior paving or wet areas that require optimum non-slipperiness. 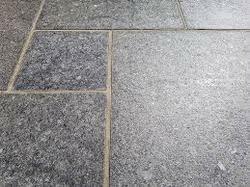 Our range of granites are provided in long lasting shine and are easy to clean when used in the kitchen. These are available in different sizes, colors, textures and specifications to suit the specific needs of clients. Our firm Sri Bhavani Speciality Products. was formed in 2003 as a manufacturer and supplier of AAC Blocks & CLC Blocks,Paver Blocks,Kerb Stones,Precast Products and Concrete Tile. The firm has been engaged in the making of varying products including Paver Block Manufacturers, Precast Concrete Block and Concrete Tile. Our products are widely used by the architectural and construction companies not only because of the variety we offer, but also the quality. In these years of experience, our firm has been able to make a distinctive position in the industry. The range, which we are specialized in producing are widely used in commercial and private gardens, lawns, parks, societies. Our products are available in various colours, patterns and materials which offer a vivid option to choose from. Our collection is robust, strong and quite durable which again makes our range a preferred choice. Our created products are precisely designed by a team of experts who are skilled and have a vast knowledge on the field. Besides our team, we have also developed an infrastructure which includes all the facilities which can ease the teams work and support them in producing a superlative range. Apart from this, our raw material vendors also play a major role in the making of our products and adding quality to it. The vendors from whom our firm procure materials are certified by the governing board and a deliverer of quality checked materials. Our firm is a quality focused organization and therefore aims at satisfying the clients with its quality and functionality.